Exclusive! 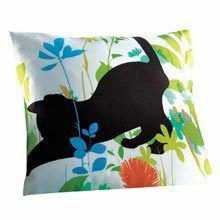 Friendly kitties play in a beautiful garden setting on this comfy Cats in the Garden Duvet Set! The polyester microfiber is super-soft and easy-care. Button closure. Machine wash. Imported. I ordered this for my niece and she loves it. Kitty does too. Great Spring Item for change of pace.